On March 17, 2013, a Service of Blessing was held for the Holly Family, Michael, Katherine, and Alyssa, at the Harrodsburg Christian Church. The Service of Blessing was held in lieu of a ground-breaking service due to the cold weather in March. After a welcome from Bonnie Rumble, Habitat VP, and Invocation from Perry Dressler, Habitat Board Member, the Harrodsburg Christian Church took over most of the service with Unison Reading of Scripture (Psalm 127:1 and 128:1) led by Dan Chilton, a solo sung by Jessica Haralu, and a Commitment by Harrodsburg Christian Church given by Dr. Mego Haralu, Sr. Minister, Harrodsburg Christian Church. A Family Bible donated by Words of Life Christian Bookstore was given to the Holly Family and their favorite scriptures (Philippians 4:13 and Psalm 118) were read by Bonnie Rumble. The Holly Family was introduced by their nurturer, Elizabeth VanArsdall. 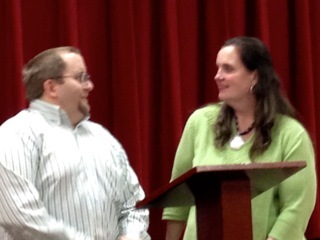 Michael and Katherine shared their thoughts and thanked the attendees for sharing this time with them. At the end of the Service, a Circle of Prayer was formed around the Holly Family as prayers were given for them and their future home.